Wallace then called Mike to say he was bringing Hugh Thompson and Larry Colburn to Vietnam to meet survivors of the My Lai massacre they had rescued thirty years before. Wallace then said he would like to include the humanitarian work MQI Vietnam was doing in My Lai as part of 60 Minutes piece they would produce. 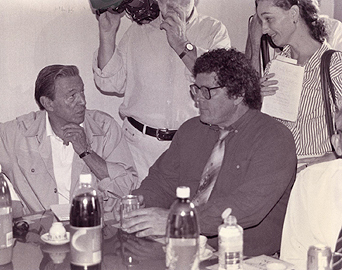 In January, 1998, Mike met with Tom Anderson, who would produce the 60 Minutes segment. Mike and Tom spent most of a day together talking about the trip to My Lai, as well as Madison Quakers projects in My Lai. When Mike Wallace and the rest of the 60 Minutes crew arrived in Vietnam in March, Mike spent three days traveling with them as filmed Hugh and Larry’s return to My Lai and their reunion with two of the women they had rescued thirty years before. In the end only a few seconds of the 60 Minutes piece were used to mention one of our projects - the My Lai Peace Park. 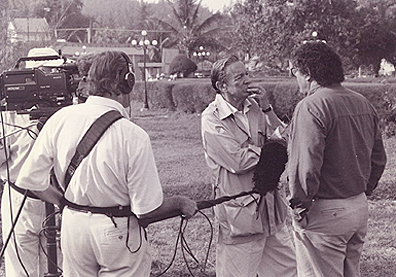 Mike Wallace interviews Mike Boehm at the My Lai Memorial. Mike Wallace and Mike Boehm attending a meeting with officials at the My Lai Memorial.